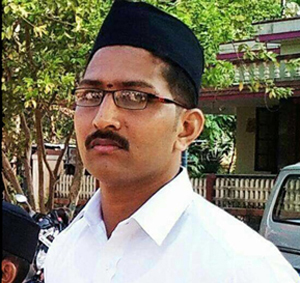 Mangaluru, Aug 7,2017: Hindu Hitharakshana Samithi, a hindu out fit announced they will organize protests before Dakshina Kannda district Deputy Commissioner’s office tomorrow Tuesday, August 8 as the police department failed to arrest the culprits behind the murder of RSS worker Sharath. The members of the Hindu stressed that the police and state government have failed to nab the criminals even after his death completes one month on August 7. RSS worker was brutally assaulted in BC Road and died at a private hospital in Mangaluru following severe injuries on August 7 after battling for life for three days. As per the protests planned, the members of various Hindu outfits will observe fast for whole day before DC office and all taluk offices located in the district on August 8. If the state government fails to nab the culprits even after the protests on August 8, the Hindu outfits would intensify their protests in Dakshina Kannada, said leaders of Hindu Outfits. Former MLC Monappa Bhandary, VHP District President Jagadish Shenava and others were present at the announcement in a press conference. The delay n arresting the miscreants in this case makes the public suspicious and a lot of confusion builds in them . Is there any political influence. Why have the police not be able to trace the accused in Sharath;s case ?